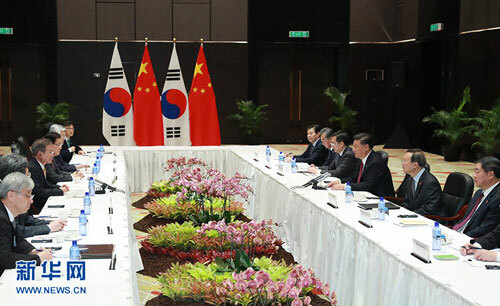 PORT MORESBY, Nov. 17 ,Chinese President Xi Jinping met with his South Korean counterpart Moon Jae-in here Saturday, calling for deepening the strategic cooperative partnership between the two countries and strengthening communication on the Korean Peninsula issue. The consensuses reached between the two heads of state have been implemented effectively over the past year, and the bilateral ties have steadily improved and developed, Xi told Moon on the sidelines of the 26th Asia-Pacific Economic Cooperation (APEC) Economic Leaders' Meeting in Port Moresby, the capital of the Pacific island country of Papua New Guinea. Xi urged the two countries to continuously deepen their strategic cooperative partnership and jointly make positive contributions to lasting peace and prosperity in the region. The two sides should continue to give full play to the guiding role of high-level leaders, respect the core interests and major concerns of each other, strengthen communication, build and consolidate mutual trust, and properly handle sensitive issues, the Chinese president said. He called for greater efforts from both sides to jointly promote the Belt and Road Initiative, accelerate the second-phase negotiations of the bilateral free trade agreement, and optimize and upgrade their mutually beneficial cooperation. Xi also proposed that the two sides strengthen coordination and cooperation within multilateral frameworks such as APEC, G20 and the China-Japan-South Korea trilateral meetings. For his part, Moon extended congratulations on the success of the first China International Import Expo, which was held in Shanghai a week ago. The bilateral relations are now showing a trend of quick recovery, with exchanges and cooperation in various areas picking up markedly, he said. The South Korean side is willing to make joint efforts with the Chinese side to deepen cooperation, thus benefiting the two peoples, Moon said. On the Korean Peninsula issue, Xi said that the situation on the peninsula has shown positive changes over the past year, and the peninsular issue has on the whole gone back to the right track of dialogue and consultation. Facts have proven that our endeavors are effective, he said. 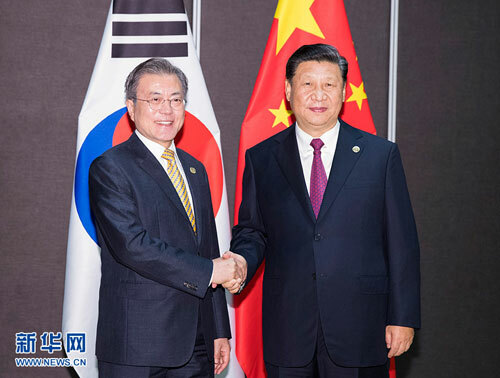 With the leadership of President Moon, South Korea has been committed to promoting the easing of tension on the peninsula, and carrying out reconciliation and interaction activities between the south and north, Xi said. China supports efforts by the two sides to continuously improve their relations, Xi said. Currently, the Korean Peninsula situation is at a crucial stage, he said, noting that China and South Korea should enhance communication, and coordinate with each other to advance the process of denuclearization and push for the establishment of a peace mechanism on the peninsula. The key is that all parties concerned should meet each other halfway, show flexibility, continue their talks and make the talks yield results, Xi added. Moon said that South Korea and China share common interest in safeguarding peace and stability in Northeast Asia. The South Korean side thinks highly of and very much appreciates the vital role of China in promoting the easing of Korean Peninsula situation and the settlement of the peninsular issue, he said, adding that South Korea stands ready to coordinate and cooperate with China more closely in this regard.